I am not sure whether I can classify gnocchi as pasta as it may have a classification on its own which I am unaware of, but for this post I will classify it as such as it is usually served as an alternative to pasta. It is usually made out with a mix of potatoes and flour then shaped together for form small dumplings. Cooked similarly same as a pasta then topped with either tomato sauce, pesto, butter or cheese. Gnocchi is popular in Italy but its origins come way back since the Roman period from the Middle Eastern countries where it was introduced to those regions by the Roman legions when the Rome Empire was in its peak. These countries develop their own specific dumplings similar to the modern gnocchi where they use the locally grown ingredients. Initially potatoes were not used until the 16th century when it was introduced in Europe. 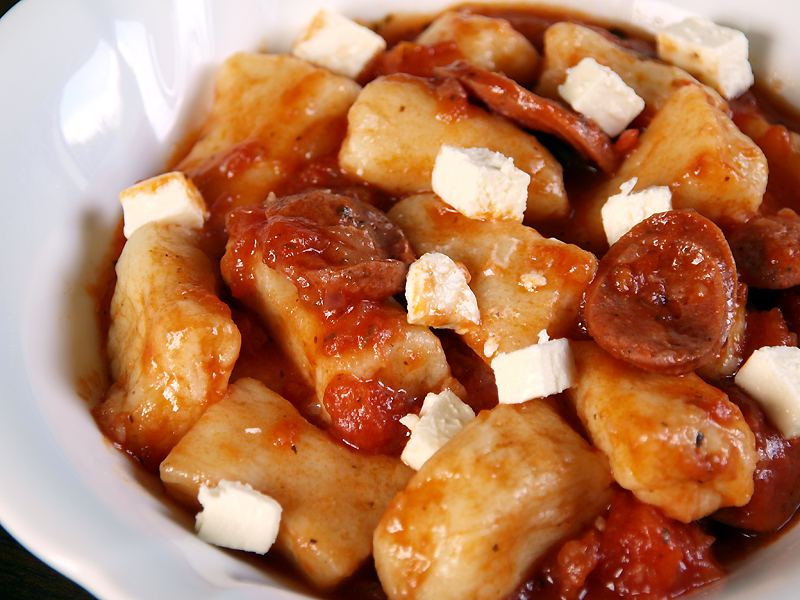 For this dish we will be topping our gnocchi with tomato sauce with basil, chorizos, pancetta and feta cheese. Best paired with steaks and grilled meats and salads. Boil the potatoes until they are soft. Remove from pot then while they are still warm. Now peel the potatoes and mash them using a fork (do not over mash, it should still have a grainy texture). Now once all mashed gently sprinkle the flour and mix in the eggs and salt. Once fully mixed, knead the dough for 4 minutes the texture should be dry to touch. Once done, roll the dough into 3/4 in diameter cylinders then cut into 1 inch long pieces. Place each gnocchi piece into a boiling water and cook for 1 minute, you will know it’s cooked once it floats. When it is cooked place it immediately in an ice bath (cold water with ice) to stop the cooking process as well and this helps them in not falling apart. Drain and pour olive oil enough to each dumpling. Now to use the gnocchi, For any sauce you use, when the sauce is nearly finished cooking just add the gnocchi in, then turn off the heat. In a heavy pan add oil then add pancetta and chorizo pieces, cook then set aside. Now add then sauté garlic and onions. Once onions turn translucent add the tomatoes, stir fry until tomatoes break down. Add white wine, basil, oregano, pancetta and chorizo then simmer for 15 minutes. Place in top of gnocchi then top with feta cheese. It was a success, great!
. This is interesting! The first time that I heard of gnocci actually. Worth trying! I’ve always adored the texture of gnocchi! mmm I am going to try making this. I have always heard that gnocci was delicious but can get very dense if you are not careful. I think it is time to see for myself. Thank you for sharing! I love gnocchi, and my partner is a great fan of chorizo, so we’ll definitely try this out soon! This recipe looks like something I could try. I’ve always wanted to use gnocchi but I didn’t know what to do with it. It looks delicious! Whoa. Yummy! Gnocchi is one of my favorite foods! Definitely trying this out soon!